My battle with Lupus began when I was diagnosed in March of 2012. I was diagnosed with Lupus SLE along with Rheumatoid Arthritis, Osteoporosis, Osteoarthritis, and Sarcoidosis of the Right Lung. The effects of these diseases have impacted my ability to live a pain free life and have caused tremendous stress on my daily activities. I have had two spinal fusions and I now suffer with constant inflammation in my hips, hands, knees, feet, and spine. I have clinical depression, cognitive disorders, memory loss, and recently discovered alopecia. My battle is present in every minute of every day and it has forever changed my life. The effects of this cruel and mysterious disease reach far beyond my exterior and I would like to sincerely thank my “team” of family and friends for the constant support I have been given throughout this entire journey, I do not know what I would do without any of you. It has been with your help that I can say… I WILL NEVER GIVE UP AND I WILL NEVER STOP FIGHTING. This is why I walk. I run because I want to show others living with lupus that we can overcome the obstacles of lupus and still accomplish great things. I was diagnosed in 1988 and I am 46 years old. I started running last year because of the lupus loop. In 2011 I walked the 2.5 mile lupus loop; It was so cold and rainy that I said to myself next year I will run this. Of course I had no plan on how that was going to happen especially with a plate in my ankle and two life threatening ICU illnesses & surgeries in 2012, but last year I ran the loop and recently I ran my first half marathon of 13.1 miles on 9/15/13( Philadelphia Rock & Roll ½ marathon). I have had 11 surgeries in my life and many hospitalizations but this is the first year: 2013 that I have not had any overnight stays in the hospital. It will be a joy for me to run the loop again this year. I have combined my team with another and our name is TEAM ROSALISA IS SOARING ABOVE LUPUS in honor of those who have passed on and those who continue to soar above lupus every day. I walk because lupus almost killed me and I had no support until I found the lupus support group and did my 1st annual walk last year. It has completely turned my life around. God had blessed me in so many ways that I can't begin to show how much I'm blessed right now. The lupus walk lets me know that we are fighters and we are making a difference to others that felt the same way I did at one point and need that same support. We are going to find a cure for us one day and God will see to it we do. Thank you for all the support from my family and my kids shai, jada, quai and kj for giving me a reason to keep fighting and pushing and pushing. And my friends and co-workers as well and definitely my physicians for never giving up on me and taken great care of me through the good and bad. In 2008, Charlotte Austin Smithhisler ("Char") saw a dream come to fruition. Char had suffered with Lupus for nearly thirty (30) years, but as a true fighter Char did not give in to despair. 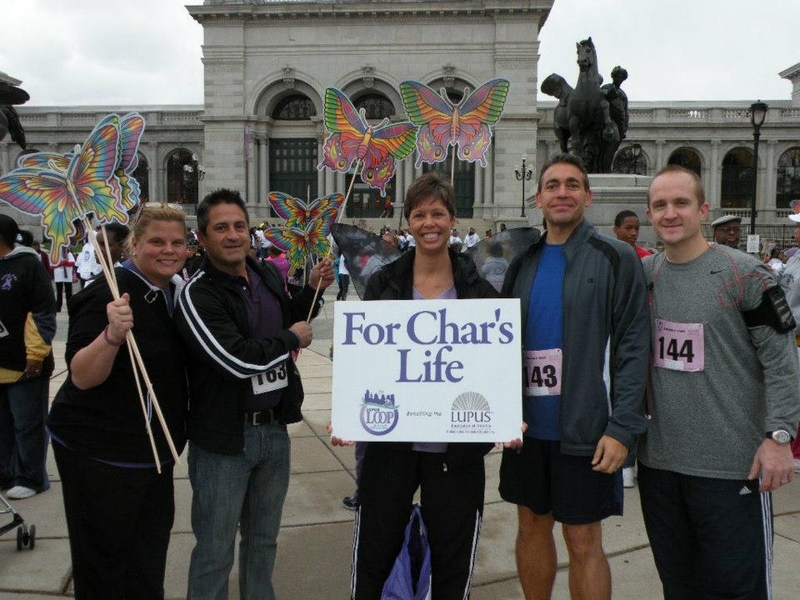 Instead, Char and her family embarked on a mission to help others in their battle against Lupus, and For Char’s Life ("FCL") was founded. The organization’s goals are to spread awareness, raise money for research, and to help individuals living with Lupus. Through a series of fund-raising events and sponsorships, FCL strives to generate financial support to benefit individuals and families by providing them with assistance such as educational grants, scholarships, computers, professional medical services, prescriptions, medical devices, household goods, groceries or any reasonable need that may make living with Lupus just a little bit easier. Please visit our website www.forcharslife.com and please follow us on Facebook. FCL is a non-profit 501(c)(3) organization and is always accepting applications to assist those with Lupus. Until there is a cure, FCL is here to help lighten the load. ~ Erika Austin, team member of For Char's Life, Inc. I walk because I can! I've had lupus for 17 years. It has disrupted my life, caused pain and damage to my body, and it has changed me. For all the things I feel I've lost - freedom, mobility, energy, opportunities - I have gained something quite unexpected. I am grateful for the small things (like a day with little pain), I am more compassionate, and I have allowed it to change the direction of my life. I walk for my family and friends. They have walked through this journey with me and because of chronic illness, I have given less of myself than I like. They have seen me on days when I couldn't participate in everyday activities. They have always loved and supported me. 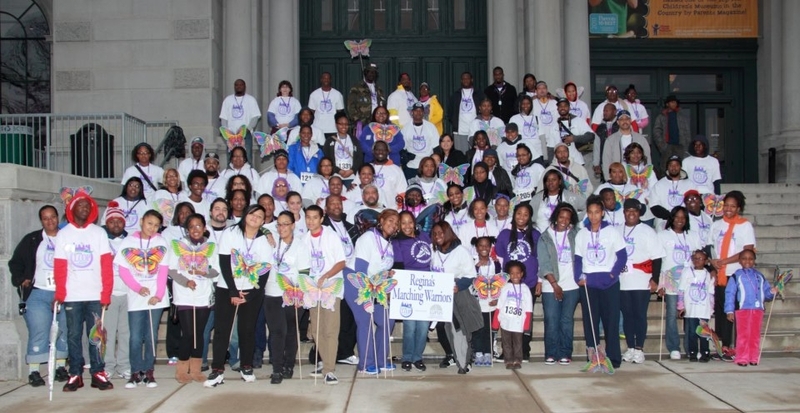 I walk for others affected by lupus. Whether I know you personally or not, I walk to encourage you to keep going on this journey. Lupus is difficult to diagnose and a challenge to live with. You are not alone. Together we will walk for a cure, and in the meantime, better treatments. Please join us to battle this mystery called lupus. We can and will unmask the wolf. Our reason for doing the Loop is why we named our team We Love Sabrina '2009'. That's the year she was taken from us, at age 32, the mother of 3, who's youngest was born that same year in January. "Bree" or "Breeny," as she was called by many, was stricken soon after Jazmine was born. She began having difficulty breathing one day while in training to be a Registered Nurse, and had to be taken to the ER in May 2009. It was discovered that she had lupus, and that the disease had damaged BOTH lungs. Bree had never smoked a day in her life. She was put on the donors' list and remained in the hospital waiting for both lungs. She continued to study to take her last exam to become an RN, and be able to graduate with her class in December of that year. Her heart was not able to take the pressures of problems with breathing, and she left us on July 1, 2009. So we will honor Sabrina Johnson, our sweet daughter, with this walk. I was an active and involved person when I was diagnosed with lupus in 2002. I had been living a full life, functioning like a normal young woman in her twenties, when I started having pain in the tip of my finger. At first, I thought nothing of it, and continued with my daily activities. One day, the pain intensified and my fingertip turned white, so I decided to go to the ER to have it checked out. I learned that my finger had lost circulation, so I was referred to a hand specialist. At this point, I was getting frustrated because I couldn't get any answers as to what was wrong with me, but I continued listening carefully to what each doctor said, regardless of my feelings. When I finally made it to the Mayo Clinic in Scottsdale, AZ (where I was living at the time), I was glad to meet with a rheumatologist. He spoke to me at length about the symptoms I was having. My next meeting with him was when I discovered I had SLE. I was not sure what to think, but I felt reassured when he told me the disease was manageable with medication. It took several weeks for me to feel the effects of those medications on my body, but I'm glad they were available to me, or I may not be here today. My life went on, although I struggled to manage the pain of swollen joints, muscle aches, losing my hair, skin rashes, sores in my mouth, and more, until 2009, when my life changed dramatically, and my lupus symptoms exasperated. I got severe stomach pain, and had a seizure in the waiting room of the ER! I had gone into muli-organ failure, which is indicative of a lupus flare. Doctors rushed to save my life, while my family was notified of the trauma. I woke up 10 days later, as I went into a medically induced coma. I spent four grueling months in ICU and overall, my full recovery took about three years - the first 6 months being mostly physical and occupational therapy. I did recover though, thanks to many wonderful people who supported me along the way. I now live in Harrisburg, PA, where I am functioning quite normally, living on disability income and a part-time teaching position. I decided to write my story to share with others who have lupus, and are still struggling. No matter what this disease does to you, there is still reason to hope and live for each day the Lord blesses you with. I have lost a lot because of lupus, but I have gained even more. Be Blessed! Me and my family walk in memory of my sister-in-law, Colleen Prendergast Obuchowicz. 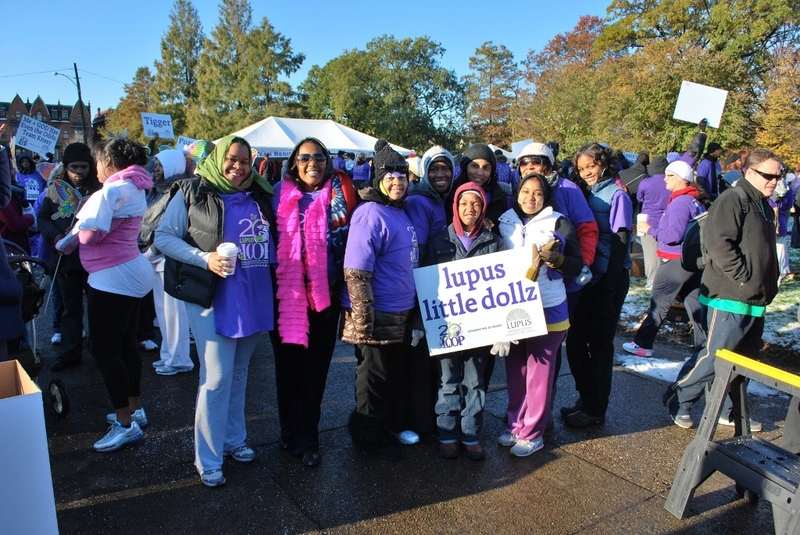 We walk to keep her memory alive for her children, but also to help people gain awareness of this disease we call lupus. I walk for the inspiration that I gain from the courageous people that I have met along the way. It was a great feeling last year when we battled the cold and walked for and in memory of all those people that battle every day to go to work, to make a happy home, or to just get out of bed, and to just hear them say the words "I can do this." I have learned so much about lupus and the long road that is still ahead for the foundations and the people who suffer every day out loud, as well as in silence. Each step we take helps those people realize we are their voice. Coming out to this walk is just a small portion of what we can do to help. It is hard to even raise a dollar, but each dollar is one step closer to a cure. I walk because I am committed, I walk because I love my family, I walk because I can. I grew up around lupus all my life. Numerous family members were diagnosed when I was a child. All of my teenage years, I spent organizing a benefit concert for the Lupus Foundation of America, each and every July from '99-'05 called River Rage. After taking a few years off to expand our River Rage team, we started again July '12 and raised over $1,800. River Rage 2013 is already in the planning. Team River Rage is walking the Loop this year in memory of the late Richard "Boppy" Kimball. This event is very important to me because I was diagnosed with lupus 12 years ago, when I was pregnant with my second child. My pregnancy was extremely complicated, and it was an experience I will never forget. There were many complications that came about during my pregnancy, which doctors could do nothing about, until I delivered my son. The first six years of my son's life were very difficult for me being in and out of the hospital and trying to cope with my newly diagnosed illness. Lately, my health has been in a stable condition - some days are better than others. I pride myself on my accomplishments in life, and for me, not allowing my disease to get the best of me. My team is a creation of friends and family members who love and want to support me. I walk for all of those who are not able to walk, for those who are no longer here to walk, and most importantly, I walk because I can! I run because I have never been able to run before now. I was diagnosed in 1989 with SLE. After many years of hospitalizations and treatments, I am finally at a point with my disease where I can run the Lupus Loop. Last year, when I walked the Loop, I said to myself, "next year, I will run this." In March of 2012, I ended up in the ICU after having emergency surgery. Four weeks later, I was back for another surgery. I thought to myself, "How am I ever going to recover from this?" After several painful months of healing, I made the decision to start running and train for this lupus race. My doctor put me in touch with a running group who helped me learn how to run. When I run this race, I will be running for those who can't run yet, and for those who live with lupus every day and continue to Soar Above Lupus. My sister-in-law most likely had lupus as a teenager but was never diagnosed until she was in her 40's. Since then, I have met so many friends who had family members with lupus, or have been told they have lupus themselves. There were not many things I could do to help my family member, but to raise my voice about this disease, and tell others about this condition which has robbed so much of a person's energy over the years. This walk is for all those brave folks living with lupus who continue to be and do all they can to give back love to their family and friends. I was diagnosed with lupus in 2006. My whole life has been a rollercoaster when it comes to dealing with my flare-ups. Thank god for medication, or I would not be able to survive. Not being able to enjoy the air conditioning in the summer and always needing heat in the winter was a challenge. Thanks to a good friend, Regina Spencer of Regina's Marching Warriors, I have learned to live and let live and not let my illness take over. I walked for two years and will continue for myself and others. I am a 62-year-old woman with lupus, diagnosed in 1991. Living with lupus is no joke. Please help us cure this disease. As we bond together for a worthwhile cause, let's help millions find hope for a cure with lupus. We can begin awareness and education - what is lupus, the types, signs, and known remedies - by seeking medical attention. Think of the many hands, hearts, and health initiatives out there. Enlist the support of your family and friends. We can do it! Forward and we march on! I was recently diagnosed with Lupus on April 2, 2012. I'm running te 5K in the 21st Annual Lupus Loop because for the first time in my life, I can. I've been dealing with undiagnosed symptoms of lupus for pretty much my entire life, and now that I am finally receiving the treatment that I need, I am doing better than I have in a long time. I never thought in a million years that I would be able to run a 5K. If you would have told me even six months ago that I would be training for the Lupus Loop 5K in October, I would have laughed. I'm doing this run for a lot of reasons. The number one reason that I'm running is for me. I'm hoping that by doing this run now while I can, I am helping my future self by being proactive in my health. My main motivator while running is that there may be a day when I cannot run, and by doing this now, I'm hoping that I am pushing that day further and further away. I'm also doing this run for all of my fellow "Lupies" who cannot compete the run themselves. This is for you. Additionally, I'm running for my amazing friends and family. I'm blessed with unconditional support and love from my friends and family and I am so happy that they will be out there right by my side. I was diagnosed with lupus in November of 2004 when I was 15 years old. From that point forward, lupus has changed my life. I actually wasn't supposed to make it when I was diagnosed because my flare was so bad. I was unable to walk, lost my hair and a ton of weight within two weeks, and I was told I wasn't supposed to have any children. For the last 7 years, my lupus has been in remission, until my most recent flare in December 2011. I am now struggling with lupus nephritis. Every day is a daily battle, but I will not let it win. I am blessed to have two beautiful, healthy kids, and have made it this far. And the reason that I walk is for them. I have lupus - lupus doesn't have me. My name is Katie. I created this team for my sister Liz who was diagnosed with Systemic Lupus and Juvenile Rheumatoid Arthritis at the age of 8. She is now 24 years old and doing great! Without the support of research and different medications over the years, she may have had a much harder road and a different outcome. She had some ups and downs, but has learned how to control her lupus and not let it control her. Liz is entering grad school this year at LaSalle University for a Masters in Speech Pathology. We all walk/run to support lupus awareness and to help her stay strong! I am married with three beautiful daughters, ages 9,7,2 and we are walking for me, as well as others suffering with the disease. I was diagnosed with systemic lupus almost 7 years ago, after my second daughter. I soon developed scar tissue on the left lung, Raynaud's Phenomenon, then hypertension, and before I knew it, kidney disease. I've had many hospital stays and surgeries due to low blood pressure and infections, surgeries to drain the infections, many sleepless days and nights and many days crashed on the couch or in bed, but I will not let this rob me of my happiness and personality! I want my daughters to have a positive attitude and to never give up hope. I feel it is very important to raise awareness and people need to understand. Our days are unpredictable, and we are in pain, even though we look fine. I don't know how I am going to feel day to day, it just hits you and you can't turn it away. I also take many medications a day. In January, it will be one year on Benlysta. Every four weeks, I receive the IV infusion, and it is helping so far. Good luck to all of you, whomever you may be supporting, and see you on the 28th! I participate in the Lupus Loop because my mother passed away due to complications from lupus on March 3, 1992. I doe this in memory of her, and for all those living with disease. I think it is very important to educate people about lupus, and to help raise funds to benefit those living with lupus now. My name is Cheri, I was diagnosed with lupus in June 1994, I'll never forget that day because it is the day that I thought my life had ended. I had been feeling sick for quite some time, most of the doctors that I went to told me that I was tired and working too hard, I am a wife and had two young children, and working outside of my home. Yes, I was tired but this was far beyond tired I could hardly lift my head off of my pillow most mornings. I searched for answers because I knew something was wrong and I needed someone to help me find the answer. I finally found my way to a Rheumatalogist who ran lots of tests because he wanted an answer as much as I did, well I finally had an answer: lupus. When he told me that I was scared, I had never heard of lupus and I was sure that I was going to die. I did my research, found out about lupus and found out that it's not a death sentence, but far too many people don't know what lupus is. I walk because I want people to know about lupus, I don't want people to be afraid, we share a common bond in this disease even though it affects each person differently. I walk for all of the support that I've received over the years, I walk so that others will be encouraged, most of all I walk for ME, because right now, I Am Living Well with Lupus! Whatever your connection to the Lupus Loop, we want to know. Send your story to info@lupusloop.org.